The wine has a medium-dark ruby color. The aromas are a complex but seamless mixture of ripe berries, tobacco, and sage. On the palate the wine is medium bodied with flavors of ripe berries, herbs and a hint of sweet oak vanillin. The relatively high acidity combined with the light to moderate tannins indicates that cellaring the wine for three to six years is recommended. 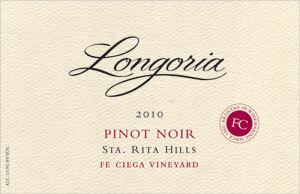 We are pleased with yet another elegant and regal rendition of Pinot Noir from the Sta. Rita Hills viticultural area. As with all vintages of Fe Ciega Pinot Noir, this wine will benefit from some aeration before serving. Decanting 30-60 minutes prior to serving is recommended. It will pair well with a variety of dishes including fowl, rabbit, and pork loin with a currant sauce.